Top deck cupcakes, need we say more? If, like us, you can never decide between white or milk chocolate these moreish top deck cupcakes were made for you. They combine the best of both chocolate worlds in a rich milk chocolate sponge cupcake topped with a smooth white chocolate ganache. They’re all yours. 2. With an electric beater, beat the sugar and eggs until light and fluffy. Beat in the melted chocolate. 3. Add the buttermilk, milk, vanilla extract and sunflower oil to form a runny mixture. 4. In another bowl, mix together the flour, salt, bicarbonate of soda and cocoa. 5. Mix the wet ingredients into the dry ingredients and stir to bring the mixture together. 6. Divide between the muffin cases or holes and pop in the oven. 7. Bake for 25–30 minutes until well risen and cooked through. 8. For the ganache, heat the cream and vanilla pod in a saucepan on the stove until it reaches the shivering stage (the top of the cream will look like it is starting to shiver, but not boil). Remove from the heat and add the white chocolate pieces. 9. Stir to combine and keep mixing until the chocolate has melted. Add the chocolate mixture to the cream cheese. Beat well to form a smooth icing, then place this in the fridge until the mixture has set to a spreadable consistency. 10. 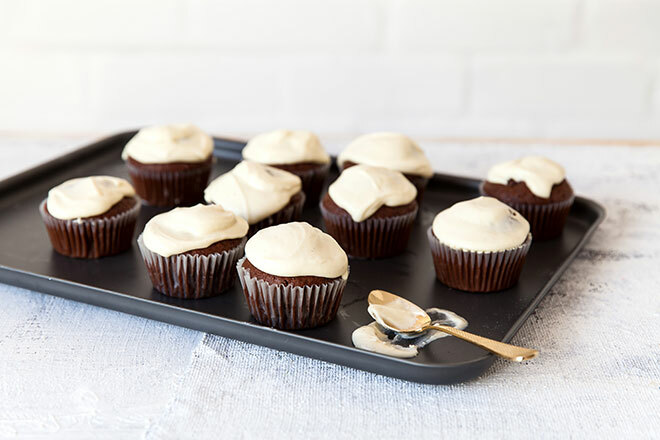 Remove the cupcakes from the oven and allow to cool completely before piping the ganache onto the cooled chocolate cupcakes, or spreading over with a palette knife for a rustic look. These cupcakes are ideal for parties as you’ll be pleasing both sides of the chocolate divide. 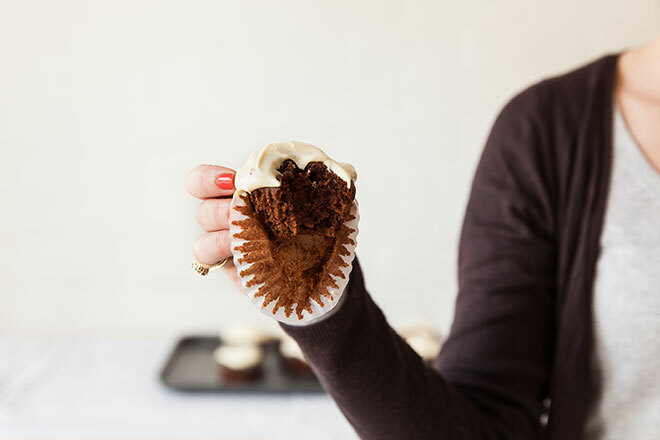 You could even spike them with a little syringe of brandy — when it comes to cupcakes everything goes.